Hip Hop Brunch London returns for a summer of bottomless cocktails and filthy beats. There are both Saturday and Sunday parties to get pumped for, with special Dim Sum sessions also scheduled throughout. Hip Hop Karaoke will be present and the venue location will be revealed to guests a few days before the event. This was one of the best daytime parties I've been to in London. Great music and a great vibe. Last weekends brunch was at Floripa in Shoreditch. Cool venue but the tables were a bit too tightly packed together. It's a popular event so expect a lot of people! The delicious bottomless cocktails at the beginning were great and its a fun start to the party. The 3 course lunch was average. I'd go to this brunch for the music and party, less for the food. The afternoon karaoke was fun to watch. Make sure you sign up early if you want to take part because its very popular. We didn't realise this and missed out! There was also a fun tattoo artist. Again, queue up early for this. Left the venue around 5/6pm and the sun was shining in London so we continued on to have a fun evening! When I say Hip, you say Hop.... Hiiiiip Hop! Hip Hop Brunch is full-on rap revelry, fuelled by cocktails, energetic hosts and enough props to supercharge your selfie game. You leave the venue late afternoon with the sun shining and feel like you've had a great night out (bring sunglasses for the transition!). Then you have a decision to make - do you use your afternoon's fun as a launchpad to a big night out, or... or.... oh stuff it, you know you're going to carry on partying! Heavy beats, fun crowd and plenty food... the perfect afternnon! Came to London from the USA for a few weeks with friends. In typical American fashion, we were looking for a good time at the end of our trip! Unfamiliar with the best party spots in London, we searched Timeout and ran across Hip Hop Brunch. We were hesitant about the time of day, but for bottomless cocktails – we thought why not? Let me say, Hip Hop Brunch did not disappoint! When you first arrive, you’ll be greeted by a host wearing all black from head to toe in typical Hip Hop fashion - ha. Walk in a little further and you’ll find posters and props spread all around the room for your use. I loved the magazine cutouts! From Eminem to Tupac to Kendrick Lamar and NWA – you’ll have a chance to get a photo op with each of them! As if the fun magazine cutouts weren’t enough, there was a MMA fighter at the brunch! When we purchased tickets in search of a good time, we didn’t think we’d be sitting a few tables over from Michael Venom Page. No wonder this place is listed as a Thing To Do for tourists in London! We were served free bottomless cocktails for the first hour followed by a three course meal – all while being entertained with a little karaoke, Hip-Hop sounds, and overall good vibes. And the place was packed! Who would’ve known that having bottomless cocktails at noon is a real thing and even better - it’s acceptable! As the smooth sounds of legendary artists like Tupac and Biggie played through the speakers, a tattooist drew customized tats with sharpies and a magician came around to our table showing off some sick tricks. Cocktails mixed with a banging beat, custom tattoos, hip-hop karaoke (though we sounded terrible) and a little magic = a good time. This past Saturday was the perfect way to end our trip. Next time I am in London, Hip Hop Brunch will definitely be on my radar! If I could give this zero stars I would. What an absolute waste of money - I can't believe we paid almost £50 per ticket for this shocking experience. Incredibly watered down cocktails (if that's what you can even call them), food was TERRIBLE and the music was so loud you had to shout to hear anyone. The organisers clearly tried to scrimp on every element of the day and spend as little money as possible. We left after the main meal (which was a very dry chicken burger and chips served in a plastic basket). The entree was three chicken wings which were covered in hairs and served in a paper tray. I can't believe this has a rating of 3.8 - surely all the positive reviews are fake. The only decent points were the friendly staff and music. Where do I start, this event ticks all my boxes, good music, good food, day time party, drinks, lots of fun and so many extra's - magician, tattoo artist and Karaoke. I can't get enough so much so I've been going for a year, the HHB team are the friendliest team I've ever come across always so helpful and you can see they truly love putting smiles on people's faces. I also love the cool venues selected its really nice to not know where the next one will be which keeps it exciting and wanting more. I love brunch. I love hip hop. I love surprises. Oh, and I love cocktails. Hip Hop Brunch manages to roll all of these into one! The location of the brunch was disclosed only a few days before the event, and it was an awesome venue! I had never been before so even more bonus points. As we arrived, classic hip hop tunes were already booming at top volume, and the DJ kept it going all day. We had an hour of bottomless cocktails to make us merry, and then a 3 course brunch. The food did come out quite late so it was more like a late lunch...but it was super tasty which made up for the wait. Once our bellies were full and our glasses empty, we headed down to the basement for Hip Hop Karaoke, more drinking and dancing. And, yes, I got on stage! Who knew you could have so much fun at 4pm! Hip Hop Brunch is where you can embrace your love for Mr West's music while drinking bottomless cocktails that are cooler than Ice Cube from midday onwards. Organised every Saturday at a secret location (we went to Paradise at Kensal Rise), it is the best way to introduce your other half to the wondrous world of brunch. Or you can keep it a secret and tell your boyfriend you're going out for a girlie brunch, but you might need to ask him to come pick you up after. What a rip off. Do not waste your time and money with this organisation. Free cocktails for an hour: a choice of two disgusting fruit punch cocktails and you can't buy other drinks during this time. Starter: Lucky if you get one little chicken wing and a crisp. No logic applied to portion size or distribution of food between tables. Staff incredibly unhelpful and unwilling to help. Desert: Not a bad brownie actually, but after having your taste buds abused by the cocktail, starter and main - the brownie did little to console my mouth. The staff: the dude's on stage did a good job in encouraging the crowd and keeping a good vibe. The lady who runs it is vile and lacks moral code or business ethics. After a disagreement with one of our group, she told the bouncers that he'd called her a 'f*cking b*tch' three times to get him kicked out. I was stood there the whole time and he was very dignified throughout their discussion. A bit like a spoilt child; when she decided she'd enough and couldn't be bothered to speak with him, she told a bare face lie to get him kicked out. This place is woeful - only got 1 star because you have to give that to qualify the review. Costly, rude staff and the service was very bad. Went for hen party, bouncer wouldn't let the hen back in within an hour of entering the venue stating she's drunk. She waited over an hour outside to sober down and still he wouldn't let her in. I would understand if she was disorderly, but this was not the case. Hence everyone had to leave within 2 to 3 hours of arrival. Ruined the whole day. But apparently I have to select Atleast 1 star before posting. HipHop Brunch, is a pretty sick event, me and a few friends went for my birthday! Music is sick, the host are good and really friendly! Food could've come a little faster however overall its good fun, would definelty recommend! HHB was great fun! Good food, good tunes, good vides and good singing (from the Burd, and rest of the crew at least, mine was questionable). The team put so much effort into the event and in bringing the crown along with them - it won't take long until you're up on your feet and want to grab the mic! Highly recommend! I've been to Hip Hop Brunch a few times now, at several different venies. The atmosphere at Hip Hop Brunch is great, staff are friendly and hosts super welcoming. The music is en point, and you will be guaranteed to get on your feet and dance along to every song! The brunch vibe is great, everyone there is there to have fun and you really feel it. The food is tasty and the hour of bottomless cocktails - just get in there quick. The props and cardboard cut outs add that extra hip hop touch and create Instagram worthy photo opportunities! Make sure you put your name down for a temporary tattoo - the artists are absolutely amazing with their Sharpie pens! The karaoke segment is great fun to watch, I wasn't brave enough to take part but I enjoyed singing along and cheering on the crowd! Special mention to host Burd who gets the crowd going! Highly recommended! Had a great time at Hip Hop Brunch - a really good vibe from everyone there but mostly from the crew. Very attentive team and the host really got the crowd going not to mention the vocals - shoutout to Burd and his crew! I attended Hip Hop Brunch for a friends birthday in January 2018. The brunch was very well organised from the email communications, to the hosts, waiters and waitresses on the day. I would highly recommend going to this brunch as it is very interactive in terms of the karaoke competitions and props to get you in the mood for the 80's and 90's era of Hip hop. The food was really tasty and well presented. I will definitely be going to Hip Hop Brunch again. Heard about hiphop brunch from a few people, group of us finally decided to check it out and we was not disappointed. Great communication via Email and very well run, good atmosphere and good interactive hosts. I was expecting a lot more for the steep price of £50! and was underwhelmed by the brunch1 organisers and staff were great but the food was horrendous and served in paper plates and wooden forks and knives, venue opened it's doors late so the hour of free cocktails didn't really match up (more like half an hour) and on top of that it didn't even matter because the cocktails were so watered down i might as well have just had a bottle of water instead!! Complete waste of money, i do not recommend it at all. Dope, dope and just dope. Thank you to dewa, burd, nandy, Russ and dj Lewis for the incredible afternoon. Will be back soooooon!!!!! My mates and I have been here a few times and for good reason. Hip Hop Brunch has a formula that delivers each and every time! It’s taken the brunch game and put a hip-hop twist on it. The first hour is free cocktails so be sure to get there on time and get to the bar as it gets busy. Free cocktails + loads of people = busy bar. So be prepared. Your three course meal is a light starter, the main lines your stomach nicely, and dessert is…excuse the pun…the icing on the cake. For extra entertainment you have hugely talented tattooists who can produce any tattoo you want…with a sharpie. A magician glides between tables and produces jaw dropping tricks each and every time (I’m still trying to figure out how he made the 5 of hearts that I wrote my name on appear in my wallet). On one occasion they had the film Juice (if you know, you know) playing on a big screen in their secret location (the location changes each week) which is another cool concept. The props are well designed and add to the hip-hop feel (blow up mics, stereos, cardboard cut-outs). You might even catch a beat-boxer or dance crew at their event. Outside of that you have a friendly and lively crew keeping the atmosphere going. The DJ’s drop old school and new school hip-hop not forgetting to pay homage to other greats like grime, bashment, garage and my favourite…funky house. It has a great vibe that continues to build through the afternoon. It all comes to a head with hip-hop karaoke that kicks off around 3ish. With a little Dutch courage behind the ‘hip-hop brunchers’ as they like to call you, brunchers get on stage and drop some lyrics to a song of their choice. This can be off the top of their dome or with the use of the lyrics on an iPad. I’ve seen people be 4 minutes wonders (as well as 1 minute flops) but fair play to all that do it. The best even gets to take home a winner’s prize. The atmosphere is great, drinks are flowing, food keeps you going and by the end of it you’ll feel like its 5am rather than 5pm. You’re bound to have a good time and if you’re looking for a great warm up to your Saturday night then I’d definitely recommend it. Just don’t go too crazy and end up not making your Saturday night out…like my mate! We celebrated my brother's birthday here!!! What an amazing venue! We enjoyed the music and the magician that visited each table! Everything about this place was amazing!!!! I would highly recommend!!! Went to Hip hop brunch for my birthday and got to say was so much fun. The Hip hop brunch crew were welcoming and live. Kept the hype going all afternoon. Music was on point and we danced till we left. Food was average but i guess you paying for the atmosphere, vibe and experience. I do recommend it. I chose this event for my partner's surprise birthday party last year and we have been back so many times since! The staff are second to none in their service, so friendly and helpful. I actually saw the cocktails being made once and contrary to some of the reviews here, they are definitely NOT watered down! I saw the amount of alcohol put in there and one of the organisers was stood by the bar staff to ensure that they put a sufficient amount in. THE FOOD IS SERVED ON PALM LEAVES which is one of THE MOST eco-friendly ways of serving food to such large numbers. I have to write that in capitals as too many people have commented that the organisers are cheap for serving on paper plates, when they are actually trying to be environmentally friendly. Hip Hop Brunch is such a great idea and as a regular brunch-goer, I am yet to experience an event like this. I would recommend this event not just as a one off visit but a regular good time! What can I say! Choose to celebrate my birthday with the hip hop brunch crew and what a birthday I had! Had booked the brunch along with the party at a reasonable price for what they offer. Venue was amazing, 3 course meal was delicious and the staff were beyond perfect. The set up they have is amazing and will look to spend a few more birthday with the crew! DJ's were incredible, taking me back to the hip hop days and had a few laughs when stepping up on the mic (wish I had practiced before hand) but the staff helped me out and was encouraging. I would highly recommend spending a Sat or Sun with the crew because it will be a day to remember I guarantee. Absolute waste of money. Almost £50 for one hour of free juice. Perhaps if they hadn't watered down the cocktails so much we wouldn't have noticed how terrible the food was. Not given any choice - chicken wings and a chicken burger which we're both terrible and served in paper trays? The karaoke didn't start for three and a half hours after you get there - so that your forced to keep paying for the overpriced drinks (£30 for a bottle of wine). Great concept and staff were great but unfortunately just ruined by greed. Had heard about this brunch from so many friends and cant quite believe how today was my first one. Feeling quite underwhelmed by Hip Hop Brunch...We wanted to go badly after hearing about it all over the social medias, so we finally went on Saturday 22nd April 2017 and here are my pro and cons. The venue was really cool, and the staff was very friendly. Music was obviously on point, with a lot of tracks we used to dance to in our teenage years. Bottomless cocktails: as a regular bottomless bruncher, this was a total shambles. We didn't get in the venue and sat at our table until 12.15pm, then we constantly had to queue to get a watery juice concoction, not feeling the alcohol at all! When we asked why coudlnt they bring jugs of cocktails to our table, our table was apparently not big enough to do so (we were 6). We eventually sussed out that if you go further down the bar, there were bartenders who could make actual alcoholic drinks and two lovely ladies who were sat at the bar kindly helped us getting served quicker! In all, it just felt we were fighting to get our free drinks which is silly considering you pay for them! Food: whilst I did enjoy the burger and brownie, it was stated we would have a 3 course meal, but the first course was simply some very pain tortilla chips with tiny portions of dips! In conclusion, while we had a great time and danced a lot, we felt the £50 really wasn't justified and I would advise anyone to go there with a normal ticket. This event was disappointing. Given that we paid £45 for each ticket, we were surprised to find that the "bottomless drinks" were just plastic cups of water, ice and a tiny splash of alcohol. The food was okay, equivalent to something you would purchase from a food truck, but certainly not worth the money. The music was good (if you enjoy hip hop), but so loud we couldn't even speak to one another. The other 6-7 strangers sitting at our table looked to be having an equally miserable time. Wouldn't do this again. One of the most incredible brunchs I have ever been too, and the fact that it's dedicated to old skool hip hop is even more amazing! My two favourite things hip hop and brunching. Me and a couple of my sisters attended hip hop brunch this Saturday for my sisters 23rd birthday and we amazed with everything we had paid for! We paid around £45-50 for each tickets which included bottomless drinks and a three course meal. We were also very impressed by the quality of the food which was a grubby styled menu which was perfect for us! It offered veg and non veg and also the dessert - which was named krishans brownie was gluten free! Just a very quick Thankyou to all the team at hip hop brunch for making our experience the best, very very pleased with the quality of food especially not many menus offer gluten free which I was shocked at so a big shout out to the chef. Thankyou once again! 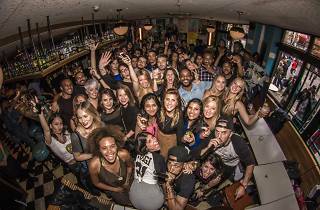 Pardon my French but Hip Hop Brunch is the S***! It's a must do if you are living in London or just visiting. The people running it and the staff make it super fun (high energy, good vibes), and it's a really mixed crowd that attend. Great food, hip hop music, venues, and people... I'll be back! Hip Hop Brunch was the one! My initial feeling was an interesting mix of apprehension and excitement. The venue was the jiving and sleek bar, Trailer Happiness on Portobello Road, known for its great ambiance and friendly staff and I wasn’t disappointed. What greeted me was fusion of a pretty and jovial crowd and an atmosphere immersed in fun and energy. It’s quite hard to find such events in the stuffy, straight laced and at times awkward settings of London’s day time party scene. As the rhythmic sounds of Sir Mix Alot’s ‘Baby Got Back’ blared from the speakers and the crowd delved into what seemed like genuine mingling, I knew I had stumbled across something very unique. The food did not disappoint either as my gastronomic senses ran wild. The eclectic menu included BBQ ribs, southern fried chicken, sweet potato fries and a range of other dishes fit for everyone’s dietary requirements. The desert was 10/10 with a delectable cheesecake capping off the experience . Comfortably and surprisingly satisfied, we were then coaxed into revealing our inner Destiny’s Child as the microphone suddenly appeared and we got down to the real business of the day, the karaoke! Name the classic, and it was sung. Renditions of the greatest Hip Hop and RnB tracks of yesteryears were recreated to the delight of all. From Kanye West, to Eminem, to Lauryn Hill and back again. It brought to the fore a nostalgia long forgotten and was a great end to a truly entertaining day! Thank you for the experience! Totally worth every penny. Went to hip hop brunch for a birthday surprise! The hip hop team were extremely helpful and they made the birthday girl feel very special. The karaoke was excellent and the food was great. All round it was a great day out- and I can't wait to have my birthday here also. Have to say apart from the music being good, this event was a complete waste of money! The food/service was horrendous...the venue opened late (12.10 however by the time we entered it was 12.15) and bottomless drinks were only for an hour however despite opening late they did not honour the hour of bottomlessu! The food was disgusting....some of our party who were vegetarian got a piece of butternut squash and that's it..the dessert consisted of 'brownies' which tasted like c&&p! If you are thinking of going to one of their events! Dnt bother....!! This was without a doubt the worst event I've ever been to. I paid nearly £50 for the cheapest food, entertainment and drink I've ever experienced. Please do not bother booking this for a special occasion and it will ruin it for you. Bloddy rip off, the only good thing was music which is a set playlist. The bottomless drink was nothing special and the food was bland, just pay £15 for the 2.30 ticket instead of going through that. If they seriously dont kick their food up a noch ASAP I definitely won't be back or recommend it to anyone else till then as £45 pretty steep for a set playlist and bland food. 100% would recommend if you're looking for something different to experience. I have a great love for food, hip hop as well as singing my heart out and this ticked all those boxes! The organisers are friendly and get involved which is great to see! I've taken a few friends along for birthday treats and they've had a blast too!! Thanks for never letting us down!! I'm already looking forward to my next visit in Feb!!! I did this brunch a year ago for £30 in a restaurant and it was good. It is now £45 and possibly the worst brunch i have attended. The food was served on paper plates with wooden knives and forks; it was cold and it was tasteless. There is little or no alcohol in the free cocktails. The only good thing is the music which repeated half way through the evening. I had heard some friends do this and was keen to check it out. I booked on the design my night website as requested for 20 percent off for people with time out black memberships. It says to email the organiser to ask if they have space before booking tickets. I did this and the response I got was not if there was space or not, But just to book. I had to explain, I did not want to book and pay money if there was no space! And thought these were quite watered down. The food was good, chicken and chips and a brownie! So I cannot complain about that! The music was amazing, took me back to my uni days! They have a tattoo artist and magician at each event too, they were pretty awesome as well. After lunch, it turns into karaoke, this is a great place for a group of friends to party on a Sunday afternoon! Queue early for the tattoo artist, he leaves quite early and he's awesome! 1) the info states a 3 course meal but the starters were to share and there wasnt enough food for everyone and the dessert was never brought out!2) unfortunately 3 members of our party were spiked they have been to hospital and had blood tests which showed that drug gamma hyroxybutyrate (GHB) was in their system. Thankfully there were 12 of us in the party and we all got home safely but this could of ended terribly. I have been hip hop brunch before and it’s always an amazing experience. The unlimited cocktails at the bar were really nice despite the slow service. The food overall was average but you have to ask the staff several times to serve the food which was annoying. The music was spot on and the DJ played all the right tracks to keep the crowd pumped. When it came down to karaoke, this was an absolute disappointment with the crew taking up most of the stage time. There was a group of 20 of us and 3 of us made a special request for the birthday boy to sing a song. It got closer to closing time and they refused to play any more tracks. After complaining several times, they finally let him sing a song only just to be absolutely humiliated by the staff. They did not supply him with lyrics as they promised then 10 seconds later they grabbed the microphone of his hands which I thought was very rude. However, I did get a forgiving apology which I really appreciated from Diwal. Considering we spent over £3000 behind the bar and tickets, the hip hop organisers really need to consider who they let sing karaoke. This however, did not dampen the mood and all of us still had the best time. Despite the disappointing karaoke, I would still recommend hip hop brunch, just don’t expect that you will get a turn at karaoke as they are very selective about who they choose. A lover of boozy brunches with an appreciation for Hip Hop, this event seemed right up my alley and lucky for my friend and I, we got to attend the 100th event. 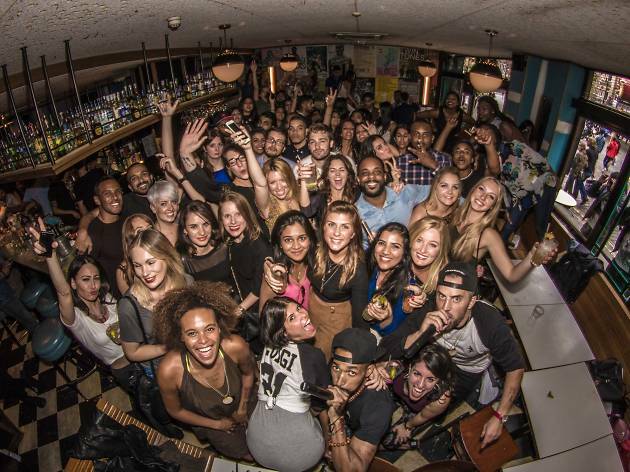 If you love unlimited booze (for one hour only but a lot can be accomplished in that time), not super fancy but tasty food and a great time with some very entertaining Hip Hop karaoke, silly props and a crew that definitely know how to get their crowd hyped up, then make sure you head to the next event. The fact that the secret location changes each time, could keep you coming back for more. I went to my first HipHopBrunch event in summer 2015 and I have been a regular ever since. I've been to many a brunch in London that include a DJ, free drinks and a good crowd but HipHopBrunch is by far the best value for money. An hour of free drinks, a three course meal, a DJ playing purely hip hop and R&B and a care free crowd all up for a great time are all included in your ticket price. The venue changes each time and will be emailed to you a few days before the event to change it up a bit. There will be a tattoo artist (using pens of course), an illusionist and a karaoke list which you can choose from. It is also the norm for alcohol to be flowing and people dancing on tables etc so I would go in with that frame of mind. The staff are also always super friendly and will ensure you are looked after - their energy is contagious. I would recommend this for any event you're looking to do; whether it be a birthday or hen. The location changes between events and I was at Paradise at Kensal Rise. Great set up inside, there were two bars in the main brunch area so we didn't have to queue at all for any of the cocktails during the free hour, an outside bit so you could catch some of the elusive sun during courses, a terrace bar upstairs, beer pong in one of the rooms and of course - the karaoke in a dark, rammed room on the top floor. Believe me, It was very easy to forget that it was only 4 pm once the party got started! I had heard about hip hop brunch from a few friends, but having visited it myself- I can definitely say it exceeded my expectations on ALL levels! I've never been to such a brunch with like-minded people who equally enjoy great music (mostly old school with some new school hip hop), delicious food, dancing and just PURE fun! I loved the bottomless cocktails to begin with- this is a great way to get you into the party spirit. The food at venue I went to was delicious, and they even managed to cater to my friends vegetarian needs last minute! Timings of the day seemed really well planned -there was enough time to eat... Drink... Dance and lastly karaoke which was the highlight of my experience- and I even surprised myself on the mic! There was a real sense of community spirit- it was such a friendly fun experience, I just couldn't resist the karaoke! I've already shared my love for hip hop brunch with all my friends and I'm scheduled to be back for 2 more birthdays in June and I simply cannot wait! If you like fun days out- great music, meeting new people and dancing.. I cannot recommend hip hop brunch enough. I heard about Hip Hop brunch from another Tastemaker and I was super psyched to try it. What's not to love about hip hop, combined with brunch? It costs £45 per person which gets you a three course meal, unlimited vodka cocktail for an hour and then an afternoon of hip hop tunes and karaoke. So how did it go? Bloody awesomely, in a nutshell. Much like Emily says below - I am mad for brunch and I am almost a psychopath in my love for hip hop. Ours was held at Paradise in Kensal Rise. As we queued with a few hen dos and a truckload of other women at 11.45am, I was a bit wary. However, we were welcomed so warmly by the hosts and that put us all in a good mood too. Staff and guests were both having such a good time from the outset, it would have been hard to have a bad time. That, combined with an hour of free vodka cocktail (which we didn't ever have to queue to get, btw) was a great start. The music was phenomenal and we were practically dancing at our tables. It was a very relaxed vibe, people chatting in between tables and although the food took a while to arrive - it didn't really matter as there were plenty of free drinks during that time. When the food did come it was a little underwhelming but I think that's more the venue it was hosted at rather than the Hip Hop Brunch element. We had a mixed selection of starters (very good), a spicy chicken burger (mediocre but a good thing to eat before you continue to drink for the next 11 hours on a bank holiday) and then brownies were served on trays a bit later on when the karaoke had started (tasty). Paradise was a great venue for Hip Hop Brunch as it has plenty of rooms - the main event was banging with great tunes, and an awesome crowd. We made some friends at the beer pong table and had an absolute blast. If you like hip hop, you'll love this event and it's great for groups. I love Hip Hop but more to the point I love brunch. I believe the venue changes each time (someone correct me if I'm wrong here) but I went to the one in Hackney. I'll warrant it could have been slightly smoother but the staff were friendly, the music was on point and the food was very good - yummy burger. Good fun, we had plenty of drinks (maybe I'm just more pushy than some as I just fought my way to the front without too much issue!) but I would do this again. If you love food, drink and absolute bangers playing on the decks, you'll have a riot. The words 'hip hop' and 'brunch' are not normally used in the same sentence and after my recent visit to this event, probably never should be. This instalment of the daytime gangster-fest was held at Hackney's Wringler and Mangle; a large converted warehouse (of course it's a warehouse, it's in Hackney!) by London Fields. The decor has a hint of an industrial look with exposed brickwork and lighting alongside large green plants and salvaged wood. They also have a large and comfy outdoor area with an awning to shield you from the rain. The brunch started at 12, with 'unlimited cocktails' from 12-1. It took roughly 15 minutes to be shown to our table and the drinks were not serviced, meaning you needed to queue alongside the other 100 or so people to get a drink. The fact there were also only 3 bar tenders on hand meant that the unlimited cocktails in fact turn out to be 3 or 4 drinks. For an an average person this is probably sufficient, but my friends and I and we were expecting at least double this. From the moment we walked in it seemed as though they were trying to drag out that first hour for as long as possible. The music however was amazing; the DJ played everything from Arrested Development to Aaliyah to Andre 3000. I was taken back to my school years of hiding away from my PE lesson with friends and playing our favourite songs from the crap speakers on our phones. They had plenty of entertainment throughout the afternoon - a 'tattoo' artist, who's work was pretty good but considering it was done with a Sharpie pen onto bare skin was slightly worrying; an illusionist and plenty of props to dress your photos with. Now on to the food. The starter was a mixture of sharing plates for the table with 2 vegetarian options but they were fairly bland. For the main, you had a choice of two options, which was either a burger or a vegetable tagine. I went for the burger alongside most of my friends and it was incredible; pink in the right places, the right amount of seasoning and practically bigger than my head. It was served with sweet potato fries and an aioli so garlicky I could've put someone to sleep. The dessert was a gluten free chocolate cake which unfortunately disappointing due the bitter taste and the minimal cream alongside it. On the plus side our waitress was great with taking drink orders and clearing our table. After food we were asked to go down the Wringler and Mangle's basement which also doubles as a club for more music, karaoke and a 'surprise'...I'm yet to find out what this surprise is. Once in the basement we were greeted with a stage where brave volunteers had the chance to sing along to their favourite track but this was mainly taken over by the Hip Hop Brunch staff stealing the lime light. The MC of the event was more annoying than stepping on a plug with bare feet and felt the need to speak over every single track throughout the day. In my opinion he was one of the biggest negatives of the day, after the drinks fiasco. All in all, if you really love hip hop and R'n'b and don't mind spending too much money, you'd probably enjoy it, but at the price of £45, I could have had a much better time if I'd gone to a different brunch for a lot less money and had enough change to get into a club afterwards! For £45 i would expect a lot more. To begin with the music was way too loud - it was fine when people were up dancing later on in the afternoon but to have a conversation on arrival and when eating was a bit of a shouting contest. The bottomless cocktails is a bit of a con. It is one choice of cocktail and served behind a small bar with just a couple of bartenders - so as you can imagine is a bit of a free for all and service is quite slow. The food was not good - the mains in particular were terrible and we had to keep on asking for peoples food as it wasn't all brought out at once (our table of 14 all pretty much ate separately). If you're into your hip hop then the music selection was good. Just don't go expecting much on the brunch perspective.